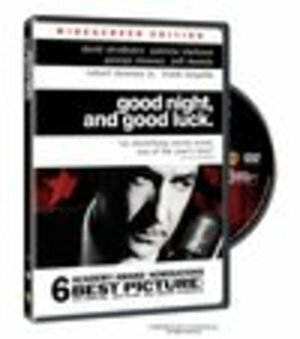 Good Night and Good Luck is an excellent movie. Kudos to George Clooney for a great screenplay. David Straithairn nails Edward R. Murrow and definitely deserved the Oscar nomination this year. This movie described how the great Edward R. Murrow took on the junior senator from Wisconsin, Joseph McCarthy, who saw "commie pinkos" everywhere. It was about the pursuit of truth, and those who did facing uncontrolled governmental power and personal risk to do so. I was impressed by the similarities between the hunt for the "red threat" in the 50's and the current paranoia we are experiencing now with regards to the "terrorist threat". I believe in 50 years we will look back at this time and recognize it as a time where we willingly gave up hard won civil rights in the name of fear. The same fear that the persecution of innocent people accused of communism aroused in American's in the 50's. In my opinion, the violations endured by honest American citizens at the hands of Joseph McCarthy is equaled by what is currently happening in our country. The "Patriot Act", illegal wiretapping, holding people for years without any due process, checking people's library records, prosecuting bit players instead of making those at the top accountable, ...all these things are far more hurtful to our current civil liberties than requiring our government to hold fast to the things this country supposedly stands for, one of which is freedom from oppression by our own government. Hopefully, in 50 years, it won't be too late. This movie was a pleasant surprise. It was funny and the special effects were good. I liked all the characters. The 6 (and a half, she will tell you) year old that went with me really liked it. She laughed and caught quite a few of the jokes. It kept both of us engaged. What more can you ask for from a kid-oriented movie? Kurt Russell and Kelly Preston were all perfect in their roles and Lynda Carter, of the 70's TV show WonderWoman played the principal of Sky High, the high school for up and coming superheroes and their sidekicks. When dealing with a group of troublesome students, she said, "Who do you think I am, WonderWoman?" as she walked from the room...haha. Overall I give it 4 out of 5 stars. I may not have gone to see it if I was alone, but it was a really fun movie to see with a kid. Great film. It went a little slowly, inching along until the last half hour or so then BAM! Creepy, creepy creepy. Subtitled in English, the innocently sweet voice of the woman speaking Japanese added to the suspense and overall creepiness. Movies where ordinary people are not what they seem and the true dark side bursts forth are always the scariest for me and this one was exactly that. I don't think I'll ever hear the word "deeper" without having the briefest flash of this film. See it. I liked it. If you go trying to see a remake of the classic movie with Gene Wilder as Willie Wonka, forget it. This version is much different. The first movie was fairy tale like. 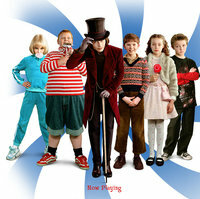 This movie with Johnny Depp as Willie Wonka is like a live action cartoon. Johnny Depp was interesting to look at and I liked his portrayal. The Oompah Loompahs were interesting this go round. If anything was sort of freaky about they movie, it would have to be them. (Or him...see the movie to know what I mean.) I'd have to give it three out of four stars. Saw the third Star Wars movie today. I'd have to give it 2.5 stars. I liked the way it wrapped the plotlines of the future movies into this movie...how the Emperor became ugly, what happened to the Jedi, how Darth Vader came to have that fancy black getup, but I just couldn't get into the characters. Anakin was a sulky little brat boy...Padma was vapid, the other characters lacked everything that would have made me care about them . The actors seemed like they were reading their scripts instead of acting. The Emperor and Yoda were the best parts of the movie. The rest of the actors were boring to watch...nothing was grabbing me or making me feel the movie like I did with the 4th through 6th episodes. In those movies, you cared about what happened to the characters. I just couldn't wait for the whole thing to be over. If it wasn't for the way they tied the storyline to the next (first) movies, it would have outright sucked. Maybe I should give it more like 2 or 1.5 stars....oh, well.